Keanu Reeves has that stoic tough guy role down to a science. He's even more affective now that he's older and more substantial in form. 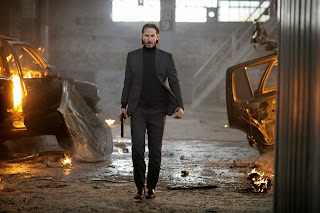 Directed by stunt men David Leitch and Chat Stahelski (who has been Keanu's stunt double for years) with a script by Derek Kolstad offer non stop action in a surprisingly satisfying action movie that is worth seeing again. What is nice is there are no shaking camera shots. You get to see every kick and punch and bullets blazing. Reeves plays the title role of John Wick who lives in a beautiful home mourning the passing of his beloved wife Helen (Bridget Moynahan). He receives a package from her that she had arranged to be delivered after her passing. A cute little beagle puppy that would help soothe his heartache. The puppy becomes his constant companion. While out doing his daily chores, a few Russian speaking thugs expressed interest in his car and try to buy it from him. When he declines, the thugs later attack his house, beat him up and kill his dog. The thugs take the car to a chop shop run by Aurelio (John Leguizamo) who recognized the vehicle's owner and tells them to take it back. Apparently the name John Wick makes even the most tough and meanest villain's blood run cold. He is known as the Boogey Man. The movie is a series of amped up revenge sequences as Wick pursues the bad guys one of whom is the son of his former boss. Alfie Allen (Game of Thrones) plays the spoiled rich son Iosef who doesn't seem to quite understand the dangerous can of worms that he's opened. After all it's just a dog. Viggo Tarasov (Michael Nyqvist) knows more than anything what Wick is capable of, so to save his son he decides to try and take out Wick first. He even puts out a open contract on Wick offering a huge award. Personally asking Marcus (Willem Dafoe) to do the job since he know Wick better than anyone. Wick checks into the Continental Hotel that is a safe place for hitmen and women run by Winston (Ian McShane) and the hotel manager Charon (Lance Reddick). No one is allowed to murder on the premises or there will be penalties. They also offer cleaner services. Ms. Perkins (Adrianne Palicki) decides to take up Viggo's offer to pay those penalties off. Yes, there's lots of killings, and inventive demises. John Wick seems like a one man army. The theme is similar to Denzil in Equalizer being a retired operative, where Wick was a hitman but managed to escape the life. Plus they are both fighting Russians, which must be the new bad guys. Maybe we can get Liam, Denzil and Keanu together for the next action movie.